I’ve been making this pie for years. It’s gluten free, nutrient-filled, easy to make and DELICIOUS! Gluten eaters are surprised this pie is gluten-free, and I always get ALOT of compliments! This recipe is from The Whole Life Nutrition Cookbook: Whole Foods Recipes for Personal and Planetary Health, Second Edition. I’ve modified it slightly by using kabocha squash vs. sugar pie pumpkin and organic cultured butter or ghee instead of coconut oil as I prefer a buttery crust. 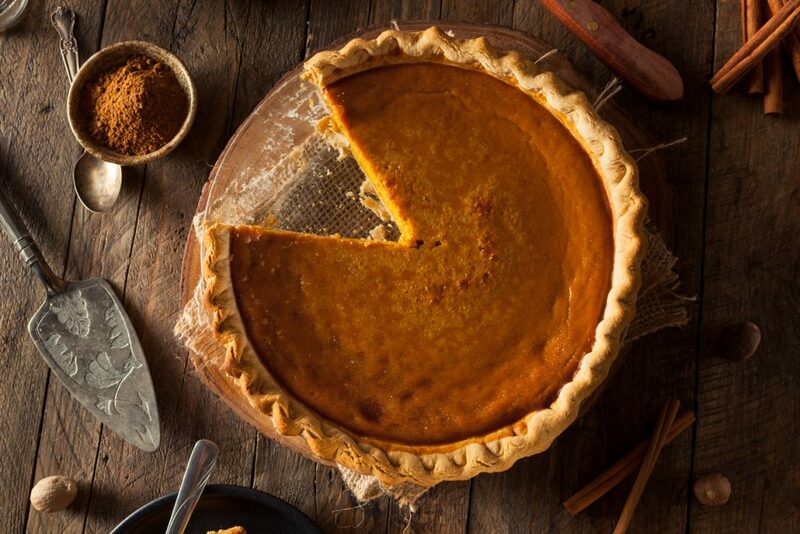 To bake the pumpkin pie, slice it in half then scoop out the seeds. Place it flesh side down in a large baking pan with 1/4 to 1/2 inch of water in the bottom. Bake at 350 degrees F for 44-55 minutes, or until flesh is very soft. To make the crust, grind pecans in high power blender or coffee grinder until fine. Place ground pecans, arrowroot powder, brown rice flour, xanthan gum, and sea salt into a medium bowl and mix together thoroughly. Add butter or coconut oil and work together with fingertips or a pastry cutter until it has a brown sugar consistency. Add water and form dough into a ball. Place dough in between two pieces of waxed paper and roll out. Gently remove one of the sheets of waxed paper and place the rolled dough into a 9-inch deep dish pie plate then remove the top layer of waxed paper. Flute edges. Prick crust a few times with a fork. Bake crust in preheated oven for 10 minutes. Let cool. To make the filling, place the cashews and 1/2 cup water in a blender and blend until smooth, 1-2 minutes. Place cashew cream into a food processor (I use a high powered Blendtec blender, similar to a Vitamix) and add pumpkin, maple syrup, arrowroot powder, spices, and process until smooth and creamy. In a small pot, pour in the 1/2 cup water and bring to a boil, Add agar flakes, lower the temperature to a simmer. Gently stir the mixture until all of the flakes have dissolved, a few minutes. Immediately put the hot agar mixture into the food processor with the pumpkin filling and process until thoroughly combined. The key to making the filling turn out correctly is to make sure that the pumpkin filling is still very hot when adding the dissolved agar to it; otherwise, the agar will gel up immediately. Pour filling into baked crust. Bake in preheated 350-degree oven for about 45 to 60 minutes or until cracking appears on the top of the filling. Let pie sit at room temperature for 1-3 hours or until cool. Slice and serve. Store remaining pie, covered, in the refrigerator for up to a week. This entry was posted in Favorite Recipes and tagged gluten free, pumpkin pie, whole life nutrition cookbook.